As made evident by nationwide organizations such as the Parent Teacher Association (PTA) and Parents and Teachers Together (PATT), a healthy partnership between parents and teachers of all grades is essential to learning and character development both on and off campus. Local Coronado educators shared their thoughts on how parents can help reinforce what teachers are trying to achieve in the classroom. Teachers are conscious of the ever-growing role of technology in their students’ lives, but they also stress the importance of limiting screen time. 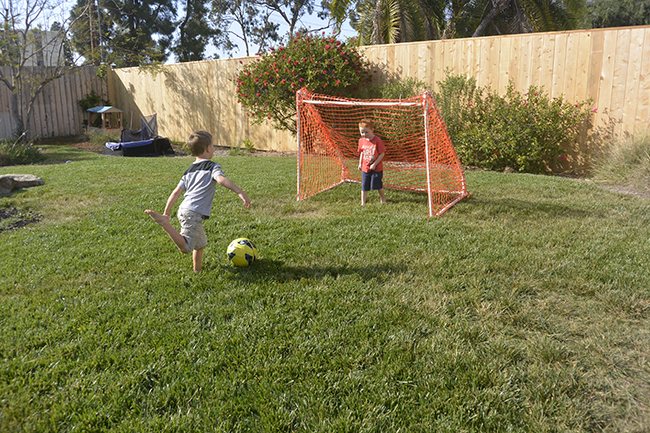 “Play games and talk to your kids at night instead of watching TV,” said Rooney. Pondrom explained that technology can be distracting and even detrimental to a student’s grades. “If your child is struggling in school, move his or her computer to the living room,” he advised. “That way, you can monitor time spent or wasted online.” Teachers across all grade levels also stress how difficult it is to reach students who are distracted by their personal technology devices in the classroom — so teaching your kids responsible use is important. On the upside, parents can harness technology to stay in tune with how their student is performing academically. The schools in the Coronado Unified School District use an online platform called Haiku to post assignments and grades, as well as contact students. Parents can take a more active role in their child’s education if they log on frequently and become aware when grades start to slip. Coronado Middle School science teacher Karoly Tippets said that parents can help their child’s learning by asking him or her for an explanation of challenging concepts. “One of the best ways for someone to construct a thorough understanding of a topic is to teach someone else; parents can facilitate this process by asking questions,” she said. Steve Patrick, who teaches fifth grade at Village Elementary, agreed that parents should non-confrontationally ask students questions beyond “What did you learn at school today?” Take it a step further by asking your children to teach you what they learned. Libby Patrick, who teaches first graders at Village Elementary School, suggested checking a grade schooler’s homework folder every day after class. Doing so will give you an idea of what was covered so you can ask the right questions and reinforce what was taught that day (and make sure they do their homework!). Physical well-being is a vital part of intellectual growth. “Parents should encourage lots of sleep and daily exercise, especially if their child is not out playing sports,” said Coronado Middle School physical education teacher Todd Thielman. Coronado High School psychology and statistics teacher Dianne Chrisman also stresses the importance of adequate sleep, saying that most teenagers need at least eight hours every night. 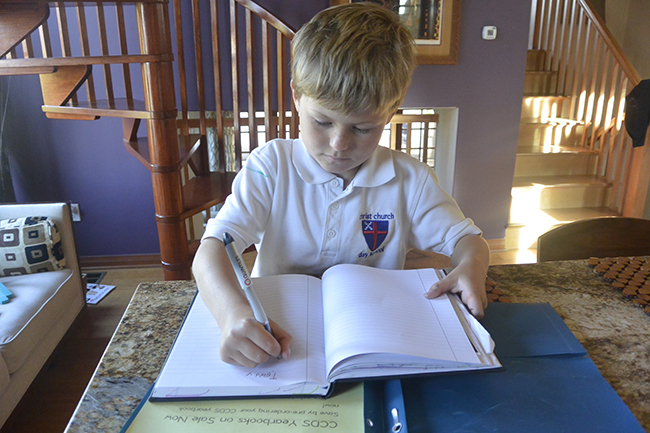 “Make sure,” she added, to feed your students nutritious food and provide them with a quiet area to do their homework.” Many teachers express that homework and extracurricular demands can be time consuming and difficult to balance — but nurturing students with ample time for rest and relaxation should be a priority as it is necessary to their success. Christ Church kindergartner Teddy Kent begins his homework. 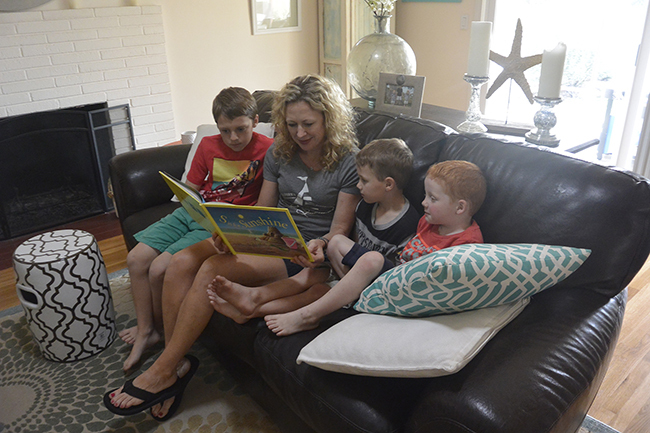 Coronado mom Micca Bucey reads to her three sons, Will, Carson and Cooper. Coronado kids Carson and Cooper Bucey enjoy some important leisure activity. Coronado High School junior Hannah Downey studies in the school library.